Former Siak District Head Arwin AS was sentenced to four-year imprisonment by Corruption Court in Pekanbaru on Thursday as he was found guilty to make money collaborately by issuing logging licenses to pulp timber suppliers during his service as District Head in 2001-2002. The Judges led by Muefri told the Court that Arwin should also pay compenssation fee amount to IDR 800 million and USD 2000 and causing the loss to the State amount to IDR 301 billions. The sentence is lighter than the Prosecutors demanded with 5 year-imprisonment as Indonesian Corruption Watch criticized the punishment as very “minimal” and unequal to crime impact caused by the defendant who was Siak District Head, Antarariau reported Thursday. Arwin issued logging licenses to timber suppliers of Asia Pulp and Paper (APP) such as PT Rimba Mandau Lestari and PT Balai Kayang Mandiri, as well as Asian Pacific Resources International Limited (APRIL’s) suppliers, PT Bina Daya Bentara, PT Seraya Sumber Lestari, and PT National Timber and Forest Product. “The punishment is dissappointing public,” said Donald Fariz of ICW shortly after the final decision that made by the Judges. “The Judges should have considered the greater element in such a decision, due to Arwin’s status at that time is District Head and his action evidently benefitted to himself, other people and companies which cost the State loss by IDR 301 billions,” Donald told Antarariau as quoted as saying. Arwin is the third official in Riau province whom punished for forestry license-related corruption cases following former Pelalawan District Head Azmun Jaafar (sentenced to 11 years in jail) and former Riau Forestry Service Head Asral Rachman (5 years). EoF learned that nobody from timber companies whom brought to Justice for the cases of corruption in logging licenses issuance as those officials experienced. Early in this month, ICW said that 15 timber companies in Riau province should be prosecuted for allegedly involving in forestry corruption along with 11-year imprisoned former Pelalawan District Head Azmun Jaafar. “KPK [corruption eradication commission] needs to investigate further alleged involvement of 15 companies,” said ICW activist, Tama S. Langkun, Rakyatmerdeka online reported last week (3/12). Tama added that the 15 companies that cited in final decision by Jakarta High Court could be brought to justice by examining their role in abusing authority in converting forest. In another development, Syuhada Tasman, former Riau Forestry Service Head, was tried for the first time at Corrupton Court in Pekanbaru which related to the verdict against former Pelalawan District Head, Azmun Jaafar, who was sentenced to 11 years in jail two years ago. Syuhada is accused of taking bribery from six timber companies in Pelalawan as he issued logging license illegally in 2003-2004, Riauterkini reported Wednesday. The prosecutors said Syuhada had caused the State loss to IDR 153 billions for issuing licenses to APRIL affiliated companies: PT Selaras Abadi Utama, PT Mitra Taninusa Sejati, PT Rimba Mutiara Permai, CV tri Lindung Bulan, CV Tuah Negeri dan CV Bhakti Praja Mulia. 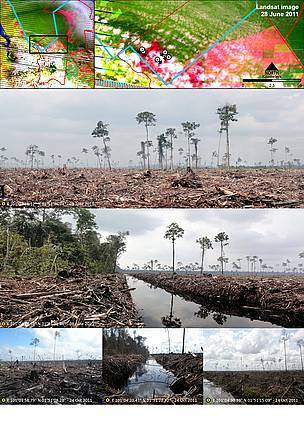 An Eyes on the Forest investigation exposed the reality behind the misleading advertisement of paper giant Asia Pulp & Paper (APP). The Truth Behind APP s Greenwash: a wood supplier (and sister company) of APP has been clearcutting tropical forest inside the Senepis Tiger Sanctuary in Sumatra, a sanctuary that APP advertises globally as part of its purported commitment to tiger conservation. According to Eyes on the Forest, APP, part of the Sinar Mas Group, has pulped more than two million hectares of Indonesia s tropical forests since it started paper production there in 1984. "This is clear proof that the global advertising claims of APP that it actively protects Sumatran tiger are untrue and highly exaggerated", said Anwar Purwoto of WWF-Indonesia. Field investigations in June and October 2011 and historical satellite image analysis up to June 2011 found that APP has started sourcing wood from inside its self-declared Senepis Tiger Sanctuary, Eyes on the Forest sayas in a new report released today, entitled The Truth Behind APP s Greenwash. "It s appalling that APP is pulping even the small blocks of forest it had told the world it would protect as tiger habitat", Hariansyah Usman of WALHI Riau said. The report reveals the truth behind this and other much-touted APP conservation projects . After apparently trying to halt a government-proposed Senepis National Park that would have protected the tiger habitat targeted by APP, the company began advertising its role in creating the 106,000-hectare Senepis Tiger Sanctuary in 2006, according to Eyes on the Forest. Yet, in fact APP made no additional conservation contribution for tigers. Eyes on the Forest found that most of the APP s sanctuary is actually outside areas the company controls 86% of the sanctuary covers already-protected forests of an unrelated Forest Stewardship Council- certified logging concession of PT. Diamond Raya Timber. Even the sanctuary s small forest blocks that APP pledged to protect is being cleared. "We would like the Sinar Mas Group s buyers, investors and licensing government officials who read this report to realize how APP s media campaigns are exploiting their lack of knowledge or inexperience about Indonesia and how they mislead their customers about the brutal reality on the ground" says Hariansyah Usman. APP is interested only in feeding its giant mills with as much tropical forest wood as possible, and hoping that customers and investors will continue to believe its ridiculous conservation commitments and advertisements. Already, many global buyers, including some of the biggest paper users in the world, have cancelled their contracts and Government media watch dog agencies in the Netherlands have taken action that blocks the Sinar Mas Group s paper company from airing misleading ads. We urge global buyers and investors to no longer support Asia Pulp & Paper s continuing shameless destruction of Indonesia s tropical forests and the homes of Sumatra s last surviving tigers, says Muslim Rasyid of Jikalahari, NGOs network. Join the growing list of other responsible companies that have cut all ties with SMG/APP. APP reacted showing a map to demonstrate that its sister company and supplier PT Ruas Utama Jaya deforested areas outside the Senepis Tiger Sanctuary as defined by the government. APP then aggressively discarded the report as "poorly researched and inaccurate report which does not help anyone who really cares about preserving the natural environment and wildlife of Sumatra". According to Eyes on the Forest's answer however, it is clear that APP is tricking again, presenting the map of the "wrong" Tiger Sanctuary, the one proposed by the government and not to the Sacturary which actually APP committed to protect. 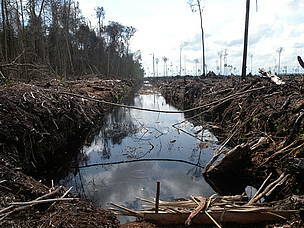 "But the 'Proposal for Rationalization of Senepis-Buluhala Sumatra Tiger Conservation Area' - signed off by Sinarmas Forestry (APP) and supplier executives on 22 June 2006 - confirms that the current clear felling is occurring inside the area designated and advertised by the company as the Senepis Tiger Sanctuary" they say. Eyes on the Forest's report includes a signed map of the proposed Senepis Tiger Conservation Area boundary of 106,081 hectares, ratified in an agreement on 21 June 2006 by Sinarmas Forestry (APP) and its two suppliers, PT. Ruas Utama Jaya and PT. Suntara Gajapati (SG). Satellite imagery shows that huge areas of dense tiger forest that government and scientists had proposed to protect as the Senepis National Park have now been cleared and drained by one supplier: PT. Suntara Gajapati. And what's about the Senepis Tiger Sanctuary as defined by the government? The Government-proposed Senepis National Park to be established for the protection of tigers and their habitat suddenly “disappeared” from discussion in 2006. It was replaced by APP’s suggestions for a tiger sanctuary located mostly (86%) on another company’s concession not related to APP; this company was already protecting its forests through sustainable FSC-certified management. Now APP supplier (RUJ) has begun clearing even the small blocks of forest in the 14 percent of the sanctuary that the company itself had proposed for protection. "In trying to deny they are clearing their own designated tiger sanctuary, they have confirmed that they are clearing tiger forest and they are pulping tropical forests in defiance of their public commitments to halt this by 2004, then by 2007, then by 2009 and now by 2015 - says Eyes on the Forests - APP is simply trying to distract people’s attention from the damning findings our report published by their aggressive PR once again." Eyes on the Forest's new report The truth behind APP s greenwash is available by Eyes on the Forest. The new report also investigates many other of APP s misleading claims and summarizes SMG/APP s profit driven, environmentally damaging actions, including destruction of unique forest types, tiger, elephant and orangutan habitat, clearance of forests inside the APP-driven UNESCO Biosphere Reserve, and illegal drainage of deep peat soils releasing millions of tons of greenhouse gases into the atmosphere, ranking APP ahead of 156 countries in greenhouse gas emissions. Companies that have cut off business ties with APP include: Office Depot, Staples, Kraft, United Stationers, Target and Mattel (USA); Idisa Papel (Spain); Metro Group, KiK and Adidas (Germany); Woolworths and Metcash (Australia); Robert Horne Group, Tesco, Sainsbury and Marks & Spencer (UK); Nestlè (Switzerland); Unilever (Netherlands); Ricoh and Fuji Xerox (Japan); Zhejiang Hotels Association (China); Gucci Group (Italy); Lego (Denmark); Leclerc (France). Many others have cancelled their contracts quietly or have committed to avoid buying from the company.